The colossal decision to remove the discipline of gold from the dollar was called the “NIXON SHOCK.” Overnight, the dollar was a “fiat” currency (backed by nothing tangible). 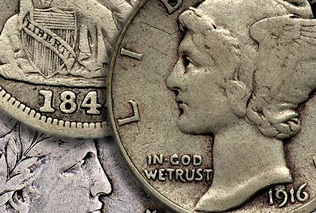 From 1792 to 1933, 1 HEAVY dollar was equivalent to 1/20th of a 1-oz gold coin. From 1934 to 1971, 1 LIGHT dollar was equivalent to 1/35th of 1 oz of gold. On the day credit collapsed worldwide (August 9, 2007), 1 FIAT dollar equaled 1/662nd of 1 gold oz. On March 14, 2008, the dollar fell below 1/1,000th of 1 0z of gold for the first time. Today, 1 FIAT dollar equals 1/1,313th of a 1-oz gold coin (left). YOUR MONEY IS BLEEDING VALUE. Since the dollar was debauched in 1971, the currency is down 3,600% against gold (it now takes 36 times as many dollars to buy a 1-oz gold coin). On the day of the global credit-collapse (August 9, 2007), gold was $662/oz. Today, it takes almost twice as many dollars to buy the same gold coin. In only 11 years, the dollar has lost about half of its purchasing-power. 2007 dollars had 2 times more strength (to buy food, housing); 1971 dollars could buy 36 times more goods and services; and 1933 dollars had 65 times more purchasing-power. Before the dollar was delinked from silver and gold, its purchasing-power was inflated away systematically. 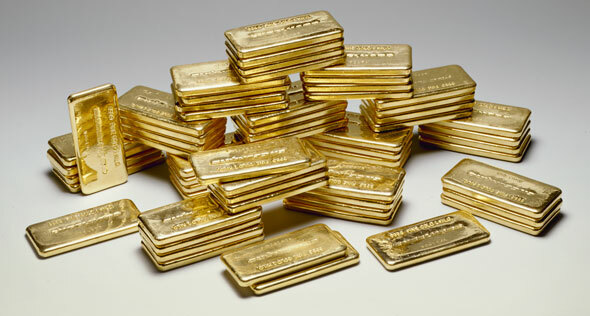 Until 1971, ‘money-printing’ was restrained by the nation’s finite supply of gold. 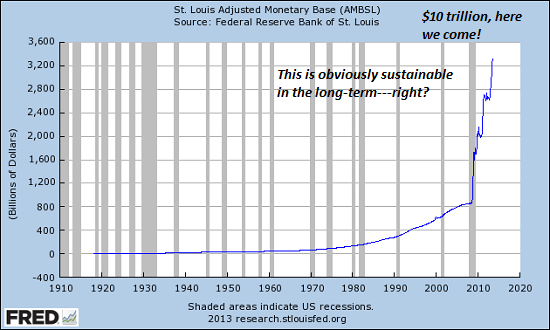 Today, the dollar-supply is unlimited. Now that the dollar does not represent tangible value, the value of the currency is derived from faith (confidence in the “full faith and credit” of the government). In 1776, Continental dollars were printed to finance the American Revolution. When people realized the dollar was not backed by silver, panic ignited near-hyperinflation in 1779 (47% inflation per month). ** Congress redeemed the dollars at 1,000-to-1: 1,000 PAPER dollars equaled the value of 1 SILVER dollar. Germany’s booming stock market was the envy of Europe from 1920 to 1922. *** When market psychology reversed, confidence in the papiermark (ℳ) collapsed. 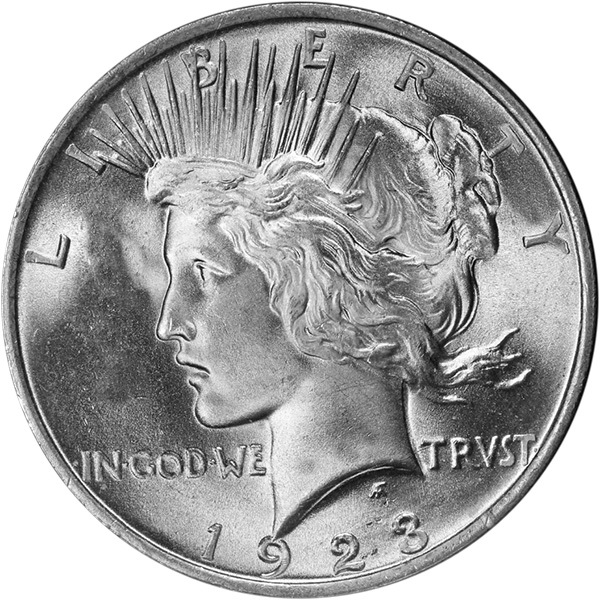 In 1919, Germans paid 16 marks for U.S. silver dollars. By the 1923 German hyperinflation, 1 SILVER dollar was equivalent to 4.2 trillion ℳarks. FUNNY MONEY KEEPS THE SHIP AFLOAT. On August 9, 2007, a single “credit event” (Banque BNP Paribas) sparked a worldwide credit-collapse. Within hours, the dollar was in free-fall; market liquidity evaporated; inter-bank lending locked up; and the international monetary system FROZE. In 2008, Bear Stearns collapsed; Washington Mutual Savings Bank was seized after a 9-day bank-run (WaMu was largest-ever bank failure); Merrill Lynch collapsed; the stock market crashed (Dow Jones Industrial Average had the biggest-ever 1-day drop); and Lehman Brothers collapsed (largest-ever bankruptcy). (new $50 1-oz gold coins). Take delivery of GOLD & SILVER DOLLARS. REAL MONEY stores value for your family. * Forbes: “Wait Until You See The Price of Gold In Venezuela Right Now,” by Frank Homes, August 6, 2018. ** Thomas E. Woods, Jr., “The Revolutionary War and the Destruction of the Continental,” Ludwig von Mises Institute Library, Mises.org, October 11, 2006. *** Professor Hans F. Sennholz, “Hyperinflation in Germany: 1914-1923,” Mises Daily Articles, Library of the Mises Institute, Mises.org, October 27, 2006. *** Steven B. Webb, The Supply of Money and Reichsbank Financing of Government and Corporate Debt in Germany, 1919-1923, “The Journal of Economic History,” Vol. 44, No. 2, pp. 499-507, Cambridge University Press, June 1984. Above: $5 Indian, $20 St. Gaudens, and $10 Indian ($1 was equivalent to a unit of gold weighing 0.048 oz or 23.22 grains). The official price of gold was fixed at $20.67/oz (1792); raised to $35 (Jan. 1934); raised to $38 (Dec. 1971); the final official price was raised to $42.22/oz (Feb. 12, 1973). The combination of currency debasement, falling production, and rising debt always ends in credit collapse. In all history, there are no exceptions. But ten years ago, few Americans had ever considered the possibility. Suddenly, on Aug. 9, 2007, inter-bank lending locked up; the dollar was in free-fall; and credit completely FROZE here and around the world. The following year, Bear Stearns collapsed (March); Merrill Lynch and Lehman Brothers collapsed (Sept. 15); and the stock market crashed (Sept. 29, 2008). The Dow Jones Industrial Average had the biggest one-day drop in U.S. history; Lehman was the largest bankruptcy in U.S. history. Since the global credit-collapse in 2007, the economy has been rocked by a series of violent after-shocks: the banking system came close to locking up again in Nov. 2011, Oct. 2014, and Aug. 2015. 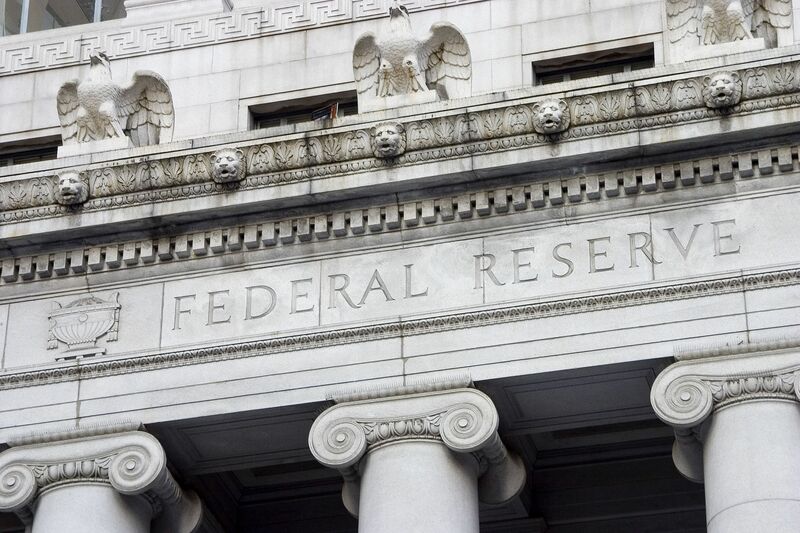 The Federal Reserve has kept the dollar-reserve system afloat by ‘doubling down’ on the excesses that led to the debt crisis. For nine years, the world has been on the biggest debt-binge of all time (U.S. debt has more than doubled). Image by Martin Kozlowski, Wall Street Journal. The Federal Reserve monetizes debt (here and abroad). From nowhere, trillions of dollars spring into existence (new debt becomes brand-new credit). 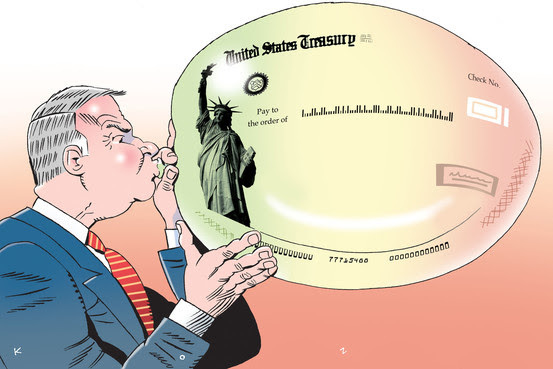 The Fed and other central banks have created, issued, financed, or enabled an estimated 1.4 QUADRILLION dollars of derivatives debt to ‘paper over’ the fragile banking system. The number attached to this debt has three more zeros than the combined value of all of the goods and services produced on earth (10 to the 15th power)! There is relatively little real collateral underlying the debt. The debt can be repaid only by more HYPER-CREDIT. The debt is merely delaying a monetary catastrophe. 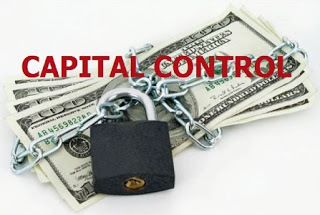 Dr. Stark told the audience that the only thing keeping the system going since 2008 is money-printing; central bankers are “flying blind;” no one knows how much money (credit) is being created or where it is going. He recommended allocating savings to traditional safe-havens such as silver and gold. The year before the global credit-collapse, gold was $525/oz [Jan.5, 2006]. The day credit FROZE worldwide [Aug. 9, 2007], the gold price was $662.60/oz [London p.m. fix]. On March 14, 2008, people were shocked and amazed when gold surged past $1,000/oz for the first time ever. However, soon after the stock market crashed [Sept. 2008], gold dropped 30% (from $1,000 to $700/oz) and silver fell 70% (from $21 to $9/oz). Did the precipitous fall in silver and gold prices mean low demand and abundant supply? NO. The ‘hit’ on precious metals was accomplish by “naked” short-selling. 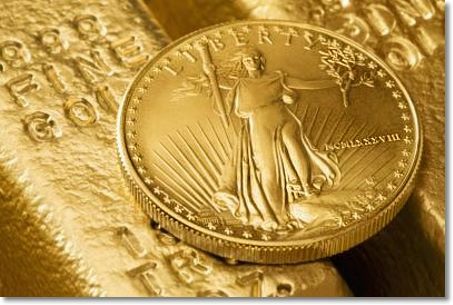 * Every scared gold-bug wanted coins; and every U.S. dealer ran completely out of coins and bars – almost overnight. Within a few days, the supply of PHYSICAL gold and silver dried up all over the country. The major world refiners had nothing. 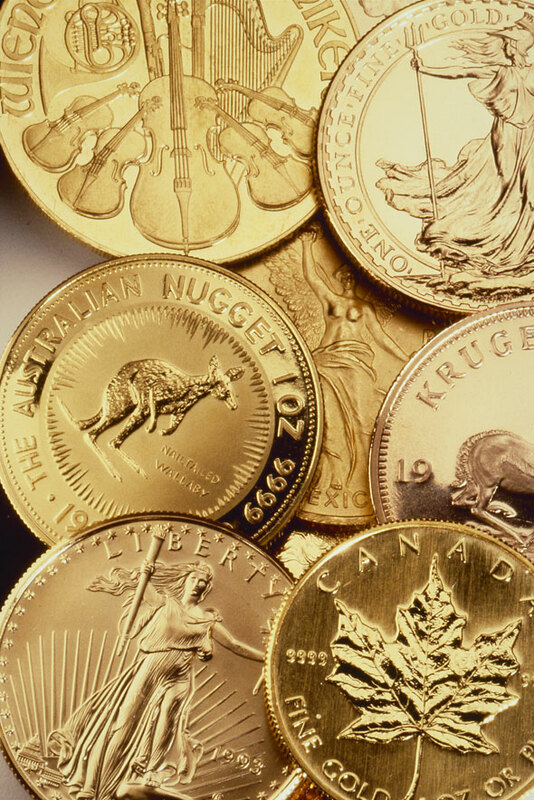 NO gold or silver was available from the five major world mints: Canada, Austria, Perth, South Africa, and U.S. Mint. Dealers could not get delivery for well over a month. In 2011, the same thing happened; and silver deliveries were delayed even longer. When the next financial crisis rocks the dollar, will supplies of gold and silver completely disappear? Today’s market indicators do not reflect what is happening beneath the surface. 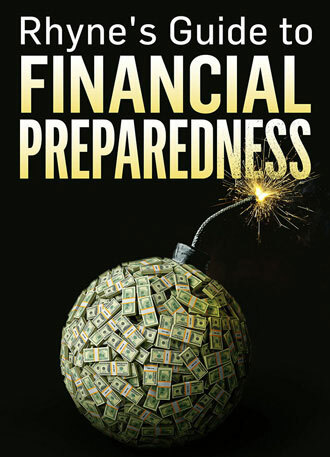 The monetary system ‘as we know it’ is coming to an end. The International Monetary Fund says a “Money Standard Shift” will be concluded during the next crisis. NEST-EGG BY SWITCHING TO REAL MONEY. If you take delivery of silver and gold, you will have protection from illiquid markets, third-party risk, and overnight currency devaluations. Today, the price of the 1-oz gold coin [above] is $1,350. Since the day credit collapsed, the PAPER dollar has lost more than half of its value against PHYSICAL gold. * Gold and the dollar are competing currencies. A rising gold price indicates a failing dollar. For this reason, the trading desk of the Federal Reserve “manages” the spot price with a trading technique called “naked” short-selling. When gold and silver break to the upside, spot prices are brought down by massive, concentrated sales of derivatives (PAPER gold and silver). Contracts representing millions of ounces are dumped simultaneously on London and New York exchanges. Things You Probably Didn’t Learn in School About Gold & Silver-pdf : Includes articles on NAKED SHORTING. Gold is the true SAFE-HAVEN currency. The dollar is ‘strong’ only when compared to more toxic currencies. Since the 2007 credit-collapse, the dollar has fallen 100% against gold. In other words, it now takes twice as many dollars to buy the same amount of gold. On the day markets FROZE worldwide [Aug. 9, 2007], the price of gold was $662.60/oz [London p.m. fix]. It now takes twice as many dollars to buy the same Troy ounce of PHYSICAL gold. The price of gold is signaling declining confidence in the dollar-reserve system. We are living in an age of manipulated financial markets – interest rates are artificially low, and the stock market is artificially high. Demand for physical gold is at historic highs, supplies are strained, yet the price is relatively low. When will manipulation of the price of gold come to an end? 2017. First, it is important to understand why the Federal Reserve is pulling out all the stops to repress the price of gold. A high gold price makes the dollar look bad. No one would want dollars if the price of gold were allowed to rise according to actual demand and actual supply of PHYSICAL bullion. Global financial markets are integrated and inter-dependent. The markets look ahead and trade on anticipation. It is now extremely bullish for gold! The last time gold and silver moved like a freight train was in the 2011. One country triggered the RUN on gold and silver. Overnight, supplies of gold and silver dried up; and mints worldwide ran out of deliverable bullion. When the leading currencies were backed by gold, the United States exported more than 40% of all manufactured products used by the world. While today the U.S. is the greatest debtor nation, fifty years ago, America was the greatest creditor nation. Back then, other countries needed sufficient gold to buy made-in-America products.